Remember that secret Destiny mission that seemingly only rewarded players with three Ghosts and the special Ghost of Praedyth? Well, it turns out that it was all leading up to a mission which was just unlocked today, one that grants players the exotic pulse rifle No Time to Explain. Players who managed to beat that aforementioned secret mission are invited back to the tower today, where they will have to swear allegiance to the Future War Cult and will have to gain about half a point of FWC rep to proceed. Upon doing that, players have to complete a few tasks for the cult, including fighting Atheon and taking down Taken Minotaur. 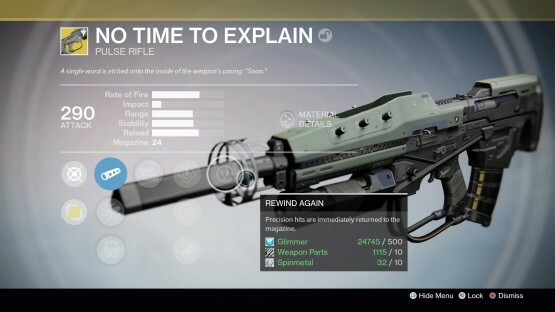 After that, though, players will be rewarded with a damaged 290 exotic pulse rifle, which can be taken back to the tower and exchanged for No Time to Explain. The stats of the weapon can be seen in the image above. Have you completed the No Time to Explain quest-line yet?